As usual, many of my blog post ideas come from a book I'm reading! For the past year or so, I have been moseying through a book called Becoming the Woman of His Dreams. Yeah, yeah, I know it sounds super cheesy, but the author Sharon Jaynes gives lots of practical bible grounded advice for being a good wife! I don't know about you, but that's something I feel like I can always use help on. It's always good to be reminded of things we can do to make our husbands feel loved. Now not many husbands are big talkers. I know mine isn't! But when he has something to say, it's usually very important. When my husband takes the time to sit down and share with me, I want the way that I listen to communicate to him that I am listening, that I love him, and I value the fact that he is talking with me! 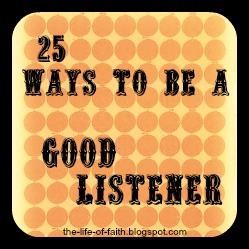 Sharon gives some practical ways to be a good listener (specifically to your husband) that I found to be very helpful! 3. Let him finish, even if he seems to be rambling;) 4. Don't interrupt 5. Face your husband and make eye contact 6. Lean forward to show you are interested 7. Stop what you are doing 8. Ask good questions and avoid the word "why" 9. Ask his opinion about something that happened to you 10. Ask him for his advice on a decision you have to make 11. Don't jump to conclusions 12. Don't give unsolicited advice 13. Don't change the subject until he is really finished with a subject 14. Make verbal responses such as, "I see," "really," to show you are paying attention 15. Turn off the TV 16. Encourage him to tell you more. "What happened next?" "What else did he say?" 17. Put down your book, dishcloth, computer etc... 18. When he is telling of a struggle, rephrase and repeat what you heard. "What I hear you saying is that you felt your boss was being unfair when he asked you to take on three more clients with no extra compensation." 19. Don't answer your phone if he is in the middle of telling you something 20. Don't glance at the time or cross your arms 21. Don't ask him to hurry 22. If a child interrupts, tell him or her to wait until daddy is finished talking 23. Don't tell him how he should have handled the situation differently 24. Don't act bored 25. Thank him for sharing with you. Great list! I definitely want to remember this. Thanks for posting! i agree, we can use this with more than just our husbands. i often find myself doing many of things its says not to when conversing with friends. thank you for sharing, Faith! I like number 15! I once heard a preacher say "when the tv is on you can never give your full attention to someone...it's more like you're giving 80% to your spouse and 20% to the tv...even if you aren't looking at it" good post today! Thanks for posting these girls! So helpful and things I totally need to remember. room for improvement, me thinks! great post! new follower and looking forward to reading more! Hi Faith! I happened to stumble upon your blog just now and am so happy I did! This post reminded me of what I shared a few days ago. My love is a very big talker as I am the quite. My father is Cuban and is also a big talker so I have got 'experience' from him on this. I'm use to my love expressing himself thoroughly. With my career, I have no choice but to listen and honestly it's the best thing for others! Nevertheless, this is a really really great list!!! We can all learn something from this. A great post with things we all need to remember. Have a super week. "Don't give unsolicited advice"--that's the one I need to work on the most! Excellent post, Faith. Thank you so much for sharing this list at The Alabaster Jar! Faith...Fabulous encouragement of how to be a good listener. Thank you for sharing at WJIM this week. Blessings.